Note: There were two Bill Whittakers in football in the 1940s (William Whittaker and William Paul Whittaker), which has caused confusion in some record books, especially as both played as a guest for Brentford at this time. Whittaker was one of 27 in the guest category. Born in Charlton, the centre-half played for England Schools and was on Arsenal's books as a youth, and then played regularly for his local League side, Charlton Athletic, during the war years (amongst his team mates in the 1944-45 season was soon-to-be Pilgrim, Maurice Tadman). It was from Charlton that Whittaker guested in green, borrowed locally within the capital to enable Argyle to fulfil at fixture at Fulham just before Christmas 1945. He also guested for Clapton Orient, Fulham, West Ham, Watford, Chelsea and Brentford during the war (confusingly, another Bill Whittaker also played for The Bees in the war years). 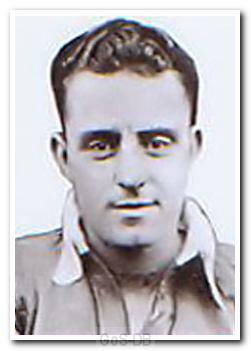 Once the war was over, Whittaker made his Football League debut for The Addicks and played 28 times across two seasons, also picking up a winner's medal in the 1947 FA Cup Final before transferring to Huddersfield Town in November 1948. He played 43 times for the Yorkshire side in the 1948-49 season before returning south to sign for Crystal Palace in 1950. He played 35 times and scored his only League goal for the Selhurst Park side before moving to non-league Cambridge United as player-manager – a role he held from 1951 until 1955. Whittaker was actually United's first manager after they turned professional in 1951 and changed their name from Abbey United. “This is just to alert you to an error in your biographical notes on Bill Whittaker in Greens on Screen. As there were two Bill Whittakers on the circuit at that time, the confusion is understandable, especially as both of them guested for Brentford. One of the Bill Whittakers was the Charlton Athletic man, and he played for quite a few clubs during the war, including Argyle, of course. The other was an England Amateur international who played for Nunhead and Kingstonian, turned out very frequently for Brentford during the war, and guested for Burnley (for whom his father Fred played many years before) in 1944/45. Arising from all that is that the following words on your biography are incorrect: ‘and amateur international’ and ‘he played for Nunhead and then Kingstonian’. I hope you don’t mind this intrusion, but your website is brilliant and I feel confident that you’d like everything to be spot on”. Thanks Trefor – the profile above has now been revised accordingly with said references removed and advisory note about the presence of two Bill Whittakers added as a header.